I like a big, bold necklace. So does Wilma Flintstone, and there ain't nothing wrong with that. This is so simple to make and beyond style points you'll also strengthen your neck muscles. Step by step instructions after the jump! 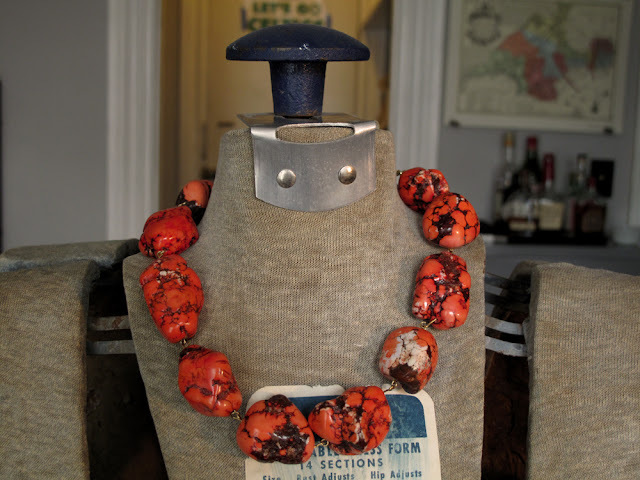 *I found these necklace rocks beads at a bead shop in Montreal. I've also made a necklace just using one rock as a centerpiece on a gold chain. Make sure that your parts are heavy duty enough to support the weight of the necklace. Go for stronger eye pins, clasps, rings and chains. 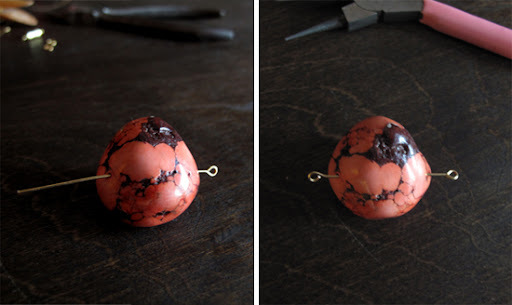 String an eye pin through each rock, trim the pin and turn the pin to create another eye on the other end. Give the rock a little bit of room to move. Do this until you have a family of pinned rocks and then join each together; eye to eye. Test the necklace on yourself to determine the length you'd like. When you're satisfied use a small amount of chain (I used about 1.5") on each end. Attach a ring on the end of one chain, a ring and clasp on the other. Attach the free end of each chain to another ring and then to the last eye on each end of the necklace. For security in strength I used the jump rings that look like micro key chain rings. They're tough to pry open but I do so first with my thumbnail until I can squeeze my pliers through to hold it open like so. 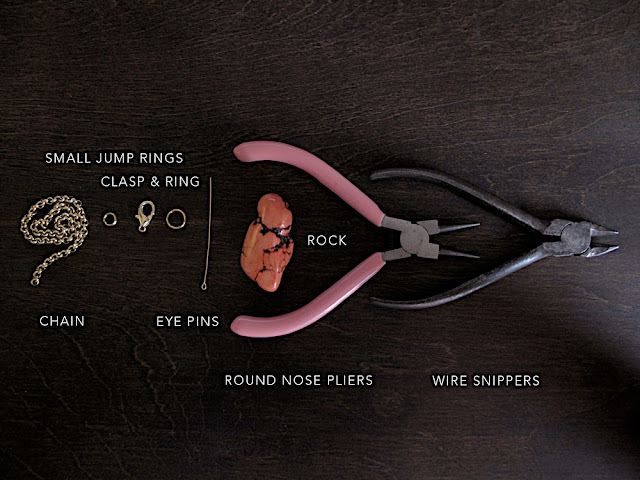 I love the simplicity of this and all the projects on this site.